Teachers at Mount Elden and Sinagua middle schools are catching struggling students and improving their knowledge of core courses before they reach high school with an innovative computer program and a little extra help from a teacher. Sinagua Middle School Principal Tari Popham and Mount Elden Principal Tom Safranek said the success is due to an intensive intervention and student support program called, Response to Intervention, that both Sinagua and Mount Elden middle schools started three years ago. Every four and a half weeks, teachers pull the grades of all of their students and look to see which ones may be struggling with a core subject such as math, writing, reading, science or social studies. The teachers meet during an early release Wednesday to talk with each other about student grades and who may be struggling. If a student’s grades show that they are struggling with a particular part of a course, such as fractions in math, they are required to go to an intervention lab for 30 minutes four days a week. Teachers also pull grades at the end of every semester and students who are failing a class are sent to the lab to get additional help. The students are pulled from their elective classes for intervention, so they don’t miss their core classes. Most of the students who are sent to the intervention lab work with a computer program called MobyMax, which can be programed to the specific subject section the student needs additional help with, Popham said. The program can also be programed to the specific standards the school district uses in its curriculum. The student has to pass progressively harder questions in the MobyMax program as a test that they understand the subject. Once they can pass the unit they missed in class, they are returned to their regular class schedule. Students who need additional help or help with MobyMax meet one-on-one with a RTI specialist like Lisa Pajkos at Sinagua Middle School. A similar program is set up with Flagstaff elementary schools, but the middle schools have really focused on the program in the last few years to make sure students are filling in any gaps they have before reaching high school, Popham said. According to Popham, about three years ago, high school teachers and principals started reporting that a large number of middle school student were coming into the high schools unprepared for or struggling with core course requirements such as algebra, reading, writing and social studies. Many of the students had to be placed in remedial classes once they reached high school. The problem is that requirements to pass a class in high school are more rigorous than they are in elementary and middle school, Popham said. The reason the requirements to pass are more rigorous in high school is because students are preparing for college and have to show they have the grades to get into a university or college. This is the first year that a full middle school class, starting in sixth grade and going all the way through eighth grade, has used the program and Popham said the students are showing progress. 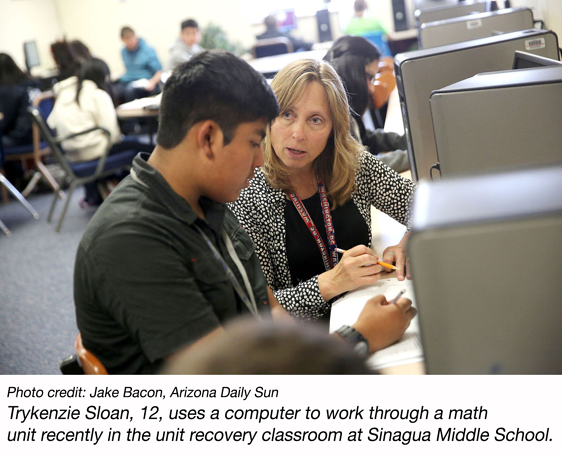 Popham said, three years ago, 89 sixth grade students at Sinagua were struggling with math. By the time that class reached their eight grade year, this year, 44 students were struggling with math. Only nine of those 44 eighth grade students were part of that first group of sixth graders who were struggling with math. At the beginning of January, 89 students at Mount Elden Middle School had to make up 165 units and 170 students at Singaua Middle School had to make up 335 units, she said. Some of those students had to make up multiple units in possibly more than one course. By April 3, the number of Mount Elden students who had to make up units had dropped to 53 and the number of Singaua students had dropped to 77. Safranek, who is new to the district, said he really likes the program. His last school district had an in-house program that was designed to catch students in a different way. This one is much more targeted, he said. “It’s not a like a jail sentence for the kids. They get to return to their class after they’ve finished catching up,” he said. “It provides them with the specific help they need. They don’t have to review a whole semester’s worth of work, they can just focus on what they missed. Although, the program is set to AzMerit standards, the district needs more data before it can tell if it has had an effect on AzMerit scores, Popham said. The district will have to follow this first cohort of students from sixth grade through high school before it will probably see an impact on AzMerit scores. The reporter can be reached at sadams@azdailysun.com or (928)556-2253. - Arizona Daily Sun published the original article here.